Now that Porsche plans to leave the World Endurance Championship’s top LMP1 class at the end of this year, the future of the WEC is in question. Now the WEC is making drastic changes in hopes of staying relevant, including flipping the schedule to end with Le Mans, returning to Sebring, and reworking LMP1 early. While the focus is on making the championship strong for the long term by getting costs back under control, it’s hard not to feel as if this is all a huge knee-jerk response to the uncertainty surrounding its top class. Regardless, here’s a rundown of the major changes on the way. The one drastic change that will effect every team on the WEC grid is to the season calendar. Instead of going on a normal yearly schedule, their seasons will become more like Formula E’s, straddling two years and running over the winter. An earlier report about going to seven races turned out to be right. The 2018-2o19 schedule will include eight races, and then 2019-2020 will drop down to seven. They also expect to hold to seven races for the foreseeable future. The WEC estimates that it will cost an LMP2 team 20 percent less to run the 2019-2020 seven-race schedule than it does to run this year’s nine-race schedule. In addition to using fewer consumables and putting less wear on the cars, longer times between races will allow teams to use less expensive means of shipping than air freight. That being said, the most exciting part about the schedule change is that the season will now end with the 24 Hours of Le Mans. Le Mans is the series’ most-hyped race, and the idea that the entire season should be a build-up to that hype is definitely one I’ve had before. As it is now, casual viewers often tune out after Le Mans is done as if the season were over. The WEC noted in their announcement that they had the same idea to end at Le Mans five years ago, when the series was formed. Making Le Mans a season finale gives it even more importance, and some fans will tune in to those pre-Le Mans races to see who’s going to dominate at Le Mans this year. Also exciting is the reappearance of the 12 Hours of Sebring on the calendar in 2019—an event in the United States that was dearly missed when it was dropped in favor of a round at Circuit of the Americas. Strangely, the WEC announced that they will be running the same weekend as the IMSA WeatherTech Sports Car Championship’s race at Sebring, but that there will be two separate races. IMSA will run a 10:00 a.m. to 10:00 p.m. schedule on Saturday and the WEC will run from midnight to noon on Sunday. Woe be unto any American teams attempting to run both. Additionally, there is still a WEC Prologue, however it will be run ahead of Le Mans at Circuit Paul Ricard instead of before the season starts. It will now now feature the opportunity to run 36-hour endurance testing so teams can prepare for the series’ flagship race. Next season’s schedule will be exceptionally weird, as it will have two runnings of the 24 Hours of Le Mans. Two! The series is treating 2018 and 2019 as transitional years in the meantime. What’s perhaps more worrisome is who isn’t on the list. Silverstone is a beloved track that has served as the series’ season opener in the past few years. The Nürburgring serves as the home track for much of the grid, including Toyota’s motorsport arm, Porsche (whose 911 RSR GTE team is run by Manthey Racing just right down the road) and soon-to-join GTE manufacturer BMW. Bahrain is also missing, so no more pretty desert lights. Neither Mexico nor Circuit of the Americas made the cut for 2018-2019, either. Circuit of the Americas, which has been on the schedule since 2013, is an FIA Grade 1 circuit built specifically for this kind of big-time international racing, and the only venue in the USA that meets that standard. Sebring, like Le Mans, is probably getting a pass for not meeting Grade 1 standards due to its extensive history with endurance racing. Then again, it would make sense to pair Sebring with a second event in the Americas, be it COTA, Mexico or even somewhere else. Not only are the logistics right, but it would give the WEC two easier-to-broadcast events in the Americas’ home time zone. 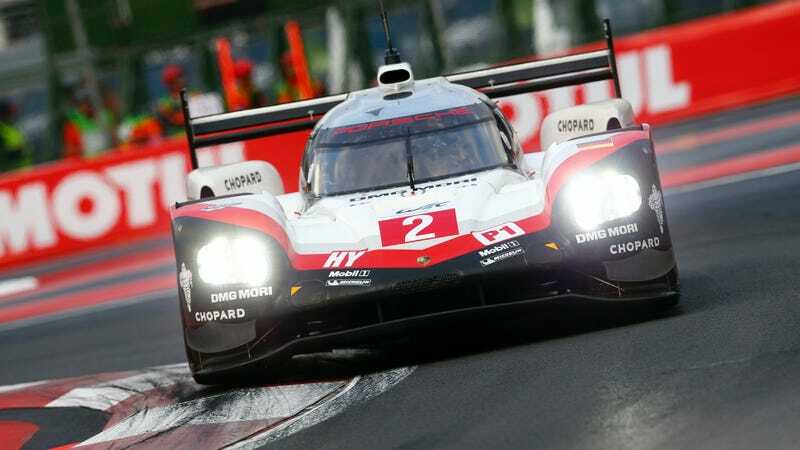 When Jalopnik asked about possible future changes earlier this week, a WEC representative acknowledged that the United States is an important market for the manufacturers in the series. We’ll keep a close eye on who pops into that “to be confirmed” slot in the near future. The biggest change of them all is coming to Le Mans’ top class. No longer will it be split into LMP1 Privateer (which got frequently ignored) and LMP1-H (for hybrid manufacturer efforts). The two floundering classes will now be combined into one LMP1 class, with one set of regulations aimed at equalizing hybrid and non-hybrid cars from the 2018-2019 season onwards. No changes will be made to the current chassis regulations, however, teams will have more choice when it comes to engine types, be they naturally aspirated, boosted or hybrid. Combining two classes that struggled to get more than a handful of participants at any one time is a good move, and leaving the engine type open is the kind of thing that fans of the WEC’s neat engineering solutions are all about. As a big fan of underdogs, the thought of a privateer being able to compete with a manufacturer LMP1 is exciting. 2020 is still going to be when the big changes to the LMP1 class are coming, so like the strange 2018-2019 season, this is a bit of a stopgap solution. Further discussions will be had in regards to other changes, such as limiting testing to cut costs further. The changes announced at Le Mans that were big on hybrid power have been thrown out the window in favor of a lower-cost set of regulations. One thing is certain so far, though: Neveu told Motorsport.com that he’s still not interested in adopting the LMP2 chassis-based DPi spec that makes up IMSA’s top class. Strangely, it appears as though the lone LMP1 manufacturer left for next year, Toyota, didn’t know what would be announced about its own class. Toyota is currently under contract to participate in the series through 2019, but without Porsche running a manufacturer-class LMP1, it’s hard to justify sticking around to compete against, uh, who? Privateer efforts that also frequently come and go? As you know, there will be some announcements soon. We just need to get this information, look at it, and come back with an opinion and then some decisions. It will not be before October at least, to make up our minds. We just need to wait and see what will be coming in the next hours and days. Toyota let everyone know that they would decide in October whether or not they would also pull the plug on this program. It doesn’t sound promising if the WEC didn’t even loop in the one team who should absolutely be looped in first about changes to its class, though. Furthermore, developing hybrid systems further has always been Toyota’s biggest reason for being involved. If LMP1 no longer requires hybrids to compete, there is less reason for Toyota to stay. As much as I love privateers, they’re generally less stable and come with less of a built-in following than the big manufacturer teams. If the last manufacturer dashes from the WEC’s top class, it’s hard to see their brave new LMP1 future lasting for long. Jalopnik has reached out to Toyota for comment and will update this story if we hear back. Endurance sports car racing has a weird cycle of booms and busts that seem more pronounced than any other series, perhaps because the cost of making a car last 6, 12, or 24 hours is insanely high. The WEC has only been in existence since 2012, but it grew out of a legacy of international sports car championships that includes beloved eras like Group C—where like LMP1, fans loved them dearly until few teams could afford to run them anymore. What the WEC wants to avoid is the next big sports car bust, and they’re moving fast to do so, presenting the new calendar and sporting regulations to the FIA World Motor Sport Council for ratification shortly. That being said, it’s hard not to feel like they’re still floundering a bit when they surprise their biggest-name participant with big changes that directly affect their team. And then there’s the bigger question: can the WEC still make itself relevant to manufacturers if their top class isn’t a testing ground for the kind of electric and hybrid technology that everyone’s pushing so hard for on the road? Our top management had a meeting with ACO/WEC on Friday morning, then all WEC team principals were informed about the proposal soon after lunch. The media were informed at 3.30pm. Prior to that, there had been ongoing communication between us and ACO/WEC, although the final details were revealed on Friday. As noted earlier, the team will determine whether they fit in this new “proposal” sometime after this month.